1. FOR THE FIRST TIME IN A DECADE, THE NUMBER OF COAST GUARD OPERATIONAL FATALITIES HAS EXCEEDED OUR OFF-DUTY FATALITIES. TO STEM THE TIDE OF FUTURE MISHAPS, I AM ANNOUNCING EXPANSION OF THE LANTAREA”DONT LET YOUR GUARD DOWN” INITIATIVE SERVICE-WIDE. THE INITIATIVE WILL REINFORCE OUR NEED TO BE EVER-VIGILANT, BOTH ON THE JOB AND OFF. IT WILL DEMAND EVERY MEMBERS DIRECT ENGAGEMENT. I HAVE ASKED RADM MARK TEDESCO, THE DIRECTOR OF HEALTH, SAFETY, AND WORK-LIFE, AND THE COAST GUARDS CHIEF SAFETY OFFICER, TO SPEARHEAD OUR EFFORTS. ADDITIONAL DETAILS REGARDING THE CAMPAIGN WILL BE RELEASED WITHIN THE MONTH. 2. SHIPMATES, AS YOU ARE ALL UNDOUBTEDLY AWARE, 2010 HAS BEEN A YEAR IN WHICH OUR OPERATING TEMPO AND THE NATIONS DEMAND FOR OUR SERVICES HAS NECESSITATED MULTIPLE “ALL HANDS ON DECK” EVOLUTIONS. YOU HAVE DISTINGUISHED YOURSELVES, THE COAST GUARD, AND THE NATION THROUGH YOUR SELFLESS SERVICE NOT ONLY IN RESPONSE TO THE HAITIAN EARTHQUAKE AND THE DEEPWATER HORIZON OIL SPILL, BUT ALSO IN YOUR ACCOMPLISHMENT OF OUR MYRIAD DAY-TO-DAY MISSIONS. IT IS INDEED AN HONOR TO SERVE ALONGSIDE EACH OF YOU. ALONG WITH PRIDE IN OUR SUCCESSES HAS ALSO COME A CONCERN FOR THE SAFETY OF OUR PEOPLE, BOTH ON AND OFF DUTY. WHILE WE HAVE HAD NUMEROUS RECENT SUCCESSES, UNFORTUNATELY, THIS YEAR, OUR SHIPMATES HAVE ALSO EXPERIENCED TRAGIC LOSS OF LIFE AND SERIOUS INJURY ON AND OFF DUTY. 3. SAFETY IS A 24/7 DUTY AND STATE OF MIND. WE AS AN ORGANIZATION MUST CONTINUE TO PLACE SAFETY AT A PREMIUM. WE WILL EXECUTE ALL MISSIONS THE RIGHT WAY, THE SAFE WAY, EVERY TIME. WE WILL EXTEND THIS ETHOS BEYOND OUR PLACES OF WORK TO OUR OFF-DUTY TIME. 4. PROMOTION OF SAFETY BOTH ON-DUTY AND OFF IS IN KEEPING WITH MY GUIDING PRINCIPLES OF HONORING OUR PROFESSION AND RESPECTING OUR SHIPMATES. SAFETY REQUIRES LEADERSHIP, ACCOUNTABILITY, AND SITUATIONAL AWARENESS FOR BOTH YOURSELF AND OTHERS. WHILE ON DUTY, WE OFTEN OPERATE IN AN INHERENTLY DANGEROUS ENVIRONMENT. DESPITE OUR BEST EFFORTS, MISHAPS SOMETIMES OCCUR. MISHAPS ALSO OCCUR OFF-DUTY, WHEN OUR SHIPMATES MIGHT NOT BE EXERCISING THE SAME VIGILANCE THEY DEMONSTRATE ON THE JOB. 5. THERE IS NO HIGHER COMPLIMENT THAN TO BE CALLED A SHIPMATE AND NO BETTER GOAL THAN BEING A GOOD ONE. BEING A GOOD SHIPMATE MEANS HOLDING YOURSELF AND OTHERS ACCOUNTABLE AND BEING SOMEONE WHO CAN BE COUNTED UPON WHEN THE ALARM SOUNDS. SAFETY IS THE RESPONSIBILITY OF EVERY MEMBER OF THE COAST GUARD FAMILY. DONT LET YOUR GUARD DOWN – BE A GOOD SHIPMATE: WHEN IN DOUBT, ERR ON THE SIDE OF SAFETY AND SPEAK UP WHEN YOU SEE SOMETHING WRONG. 7. STAND A TAUT WATCH…SEMPER PARATUS. 8. RELEASED BY ADM BOB PAPP, COMMANDANT. June 3rd marks the beginning of Fleet Week in Portland Oregon. Most of us are quite comfortable when it comes to operating on our small boats, but may have become rusty when it comes to protocol for the larger ships that will arrive in port. For this reason, I think it’s a good time to review protocol for any members who may find themselves on any of the ships during the festival or down at the sea wall. When you are in uniform and boarding any ship and the national ensign is flying, you halt at the gangway, face aft, and salute the ensign. You then turn to the OOD (Officer of the deck), salute and say, “I request permission to come aboard, sir/ma’am.” You should then add the purpose of your visit: “to tour the ship”. When you leave a ship, the order of saluting is reversed. You salute the OOD first and say, “I request permission to leave the ship, sir/ma’am.” After receiving permission, you then face and salute the ensign (if it is flying) and depart. When you are leaving a ship in civilian attire, the procedure is reversed. You stand at attention in front of the OOD first and say, “I request permission to leave the ship, sir/ma’am.” After receiving permission, you then stand at attention facing the ensign (if it is flying) and depart (Again, no salute because you are not in uniform). Members should render a salute to any officer of equal or higher rank when wearing their cover outdoors. It is customary to hold the salute until it is returned or until the officer has past. Staff officers who wear officer insignia should be prepared to return salutes rendered by junior officers or enlisted. Salutes should be rendered smartly. Look the individual whom you are saluting in the eye when rending the salute. This is usually accompanied by a “Good afternoon/evening Sir/Ma’am”. Go out and have a good time, but please ensure you are in proper uniform. Remember that your conduct and appearance reflect not only on yourselves, but also your unit and the Coast Guard as a whole. Today was the first day of the Portland Boat Show and Flotilla 73 was there. Gayland Rogers, FSO-PV, and Lynn Easton were among the Auxiliarists working hard to spread the word about boating safety. I asked Gayland to provide a brief report on his experience there. (more on that in a moment). First, let me say that it’s not too late to help out. Daren and John still have openings available and we need your help. Please take a moment to view the boat show calendar (located here) and see if you have time to help during any of the remaining slots. Contact Daren or John directly and they will cut you orders for the event. Worked the show for about five hours. Lynn Easton “jump started” his PV effort by visiting many program members and updating his contacts. 1. Inquiries for when, where, and content for both BSS and ABC classes. 2. Are boater safety cards issued by the State good in other states, i.e. is a Washington card good in Oregon ? Answer: Yes. All states are reciprocal. remains operational, does it remain a valid PFD ? Answer: No, because it was altered. horsepower for the converted craft ? Answer: Referred to USCG manual for “backyard boat builders” that provides all calculations. We had steady traffic during the five hours I worked the show. Booth looks pretty good with adequate handouts. Experience was enjoyable. I don’t know why more AUX members aren’t involved. 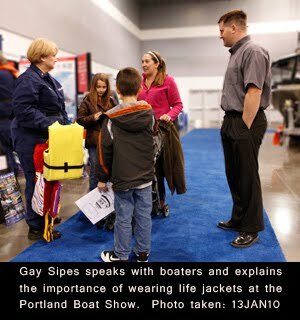 Lastly, please accept my sincere thanks to all of you who are helping to make this years boat show a success by supporting the Coast Guard and the boating public! Portland’s US Coast Guard Auxiliary Flotilla 73 welcomes Scott Brewen as the new Director of the Oregon State Marein Board. The Oregon State Marine Board made their selection for a new Captain to take the helm for the state’s boating agency. The Board selected Scott Brewen as the new State Marine Director. Brewen comes to the Marine Board from the Department of Corrections where he served as the Chief Administrator of Human Resources. Brewen is a former Coast Guard Commanding Officer with experience in Maritime Law Enforcement and Search and Rescue operations for District 13 and a former Training Supervisor for the Oregon Department of Public Safety Standard and Training (DPSST). Brewen has extensive boating knowledge and enthusiasm for boating. Brewen began with the Marine Board on May 17, 2010. Welcome aboard from US Coast Guard Auxiliary Flotilla 73, District 13! Shipmates,As you may already know, the Uniform Distribution Center is now accepting Auxiliarist orders for the new untucked ODU uniform. It’s important to note that this is a new uniform and you sizing is different from the tucked version of the ODU. For that reason, you should not order the same sized untucked ODU as you wore in the tucked version. The Coast Guard has established a web page to assist you in selecting the appropriate size. 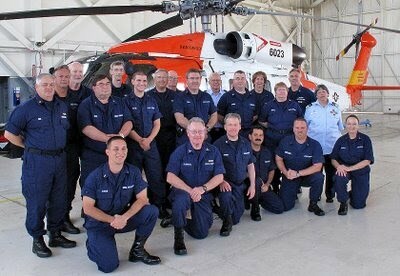 Please see http://uscg.mil/uniform/ODUUntuckedUniforms.asp before ordering your new uniforms. This will save you a lot of time and frustration in the long run. For more information on the ODU uniform, see the ODU Uniform page. We’ve just now received word that a new C School class is available for Auxiliarists who are interested in Public Affairs and Marketing. “AUX-12 Public Affairs & Marketing C School” will be held in Mobile Alabama between 05 March and 07 March 2010. Enrollment is limited to DSO, SO and FSO PA and PB officers and elected officers. It is critical that you contact Earl Olson, our FSO-MT, right away if you are interested in participating in this class. The deadline for requests is 14 JAN 2010. There are only 6 seats available and time must be allowed so the Coast Guard can cut orders. If you can’t make this class, next one appears to be offered 16 APR to 18 APR in Alameda, California. Please contact Earl or myself if you have any questions. The Oregon State Marine Board has begun to require a new permit as part of their Aquatic Invasive Species Prevention Permit Program. It is important that we’re all familiar with this program as any of us are likely to receive questions about it while interacting with the boating public. In summary, this new program is designed to protect our waterways from the damaging impacts of aquatic invasive species (AIS). It requires boaters to purchase an AIS Prevention Permit to use their boats beginning January 1, 2010. The $5 fee is automatically paid when powerboats or sailboats 12 feet or longer are registered for the 2010 boating season. Powerboats with registrations that expire December 31, 2010 do not need a permit until 2011. The $5 fee will be included with the boat registration renewal. Operators (14 years of age or older) of manually powered boats 10 feet or longer, such as canoes, kayaks, drift boats, rafts and small sailboats, must purchase and carry the $7 permit ($5 + $2 service fee) when using their boat in 2010. Operators of these vessels may be surprised by this new requirement as they have not traditionally been required to hold any special permit when using their boats. Failure to carry the permit after January 1st, 2010 is a Class D Violation which may carry a $142 fine. These permits are available at all ODFW license agents. Out-of-state powerboat operators will pay $22 ($20+$2 agent fee), also via ODFW license agents. Want to get involved? See my posting on Invasive Species Inspector Qualification at the Flotilla’s web site: www.Flotilla73.org. serve as AUX-C to the former ISC in Seattle. Program. Penny, as ADSO-OP-I, will report to Fred Bell, DSO-OP. Please join me in congratulating Penny on her new appointment. As previously noted, 2010 will be a year of change. I received word today that we are all to use a new 7029 form when reporting our time as of January 1st, 2010. I’ve uploaded the form onto our web site at www.Flotilla73.org on the “Forms” page. It’s way down at the bottom of the list, but is what you should use from now on. 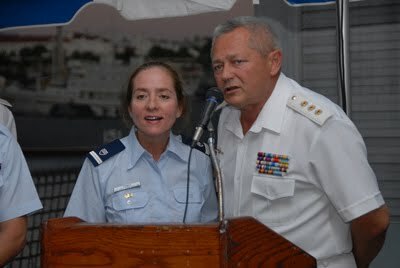 99-A – AUXILIARY LEADERSHIP: Report all time spent by elected and appointed staff performing National, District, Division, and Flotilla position duties. This includes all time spent for preparation and travel for these duties. 99-B – RECREATIONAL BOATING SAFETY (RBS) SUPPORT: Report all time spent in RBS Support that is not otherwise reported on a 7030, 7038, 7039, or 7046. This includes all time for preparation and travel in support of missions reported on 7030, 7038, and 7046. 99-C – Marine Safety (MS) Support: Report all time spent in MS Support that is not otherwise reported on a 7030 or 7038. This includes all time for preparation and travel in support of Marine Safety, Marine Environmental Protection, Commercial Fishing Vessel, Uninspected Passenger Vessels, and Uninspected Towing Vessels. 99-D – TRAINING SUPPORT: Report all time spent in Training Support that is not otherwise reported on a 7030 or 7039. Any hours spent as a Trainee, other than attending a workshop, should be reported here. This includes all time for preparation, study, homework, and travel regardless of the level of training. 99-E – AUXILIARY ADMINISTRATIVE/LOGISTICAL SUPPORT: Report all time spent for Auxiliary and CG Support missions not otherwise reported on any other form or any other Mission Code above. Include all time working on committees or attending meetings (if you are not an elected or staff officer.) This includes all time for preparation and travel. Any time that you have book since January 1st, 2010 must be entered on this new form. Please feel free to contact me, or John Stuhr our FSO-IS, if you have any questions. New 2010 C School Training Opportunities! The FY10 Auxiliary C School Course Schedule contains a listing of upcoming C School training opportunities. Please note that some of these courses have request dates in the very near future. Short Term Training Request (STTR) in advance of the deadline date in order to be considered for any of these courses. These get processed up at District 13 and can take some time to complete. For that reason it is critical that you notify Earl Olson, our FSO-MT, if you are interested in attending any of these classes. Also, please be sure that you meet the prerequisites for the course you wish to attend. 1. Course code – 501563 Name – AUXLAMS A Dates – OCT 23-25, 2009 Duration – 3 days Max # of students – 24, 2 instructors Trng location – CGAS Cape Cod ORDERS MUST BE REQUESTED SEPT 8th 2009!!! 2. Course code – 501568 Name – AUXLAMS B Dates – NOV 13-15, 2009 Duration – 3 days Max # of students – 24, 2 instructors Trng location – CGAS Cape Cod Orders MUST be requested SEP 25th 2009. 3. Course code = 400385 Name = AUXSCE Dates = 16-20 NOV 2009 Duration = 5 days Max # of students = 25 Trng location = Sector Seattle Orders MUST be requested SEP 25th 2009. 4. Course code – 501548 Name – Aux-10 AUXDATA Start/end dates – 26-28 OCT 2009 – ESU Miami 19-21 May 2010 – CG Academy Duration – 3 days Max # of students – Miami – 14 CG Academy – 24 Trng location – ESU Miami in OCT 2009 CG Academy in May 2010 Orders for the OCT class MUST be requested by SEP 8th!! AND Course code – 501548 Name – Aux-10 AUXDATA Dates – APR 9-11, 2010 Duration – 3 days Max # of students – 30, 3 instructors Trng location & address – Will County Office Bldg 302 N Chicago St. Joliet, IL 60432 Other sessions’ orders must be requested NLT 6 weeks from the class start date. 5. Course code – 501561 Name – JR DIRAUX Start date – 3 NOV 2009 End date – 5 NOV 2009 Duration – 3 days Max # of students – 9, 2 instructors Trng location – Sector Milwaukee Orders MUST be requested SEP 16th. 6. Course code = 501574 Name = Aux-18 Spatial Dis Start date = 18 FEB 2010; End date = 19 FEB 2010 Start date = 18 MAR 2010; End date = 19 MAR 2010 Start date = 17 JUN 2010; End date = 18 JUN 2010 Duration = 2 days Max # of students = 30, 1 instructor Trng location = NAS Pensacola Orders must be requested NLT 6 weeks from the class start date. 7. Course Code = 501063 Name = Aux-04 Dist Ed Tech Start date = 29 APR 2010 End date = 3 MAY 2010 Duration = 5 days Max # of students = 12, 4 instructors Trng location = ISC Alameda AND Code – 501063 Name – Aux-04 Dist Ed Tech Dates – JUN 3-7, 2010 Duration – 5 days Max # of students – 24, 4 instructors Trng location – CG Academy Orders must be requested NLT 6 weeks from the class start date. 8. Course code = 501065 Name = Aux-06 ATON & Charting Start date = 18 JUN 2010 End date = 20 JUN 2010 Duration = 3 days Max # of students = 30, 4 instructors Trng location = TRACEN Yorktown Orders must be requested NLT 6 weeks from the class start date.